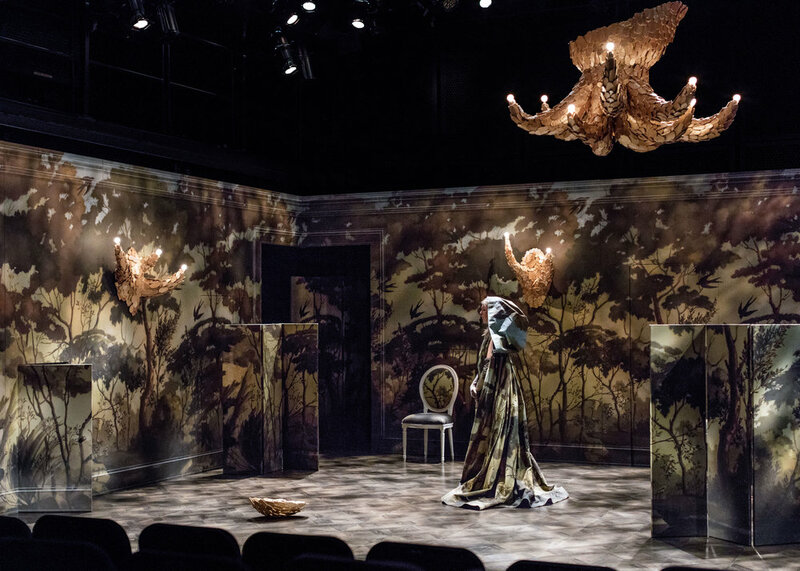 Charlap Hyman & Herrero designed the sets for La Calisto, Francisco Cavalli's baroque opera directed and choreographed by Zack Winokur at the Juilliard School's Wilson Theater. Collaborating with artists Misha Kahn on the gilded light fixtures and Pilar Almon on the painted scenic backdrop, the intimate black box theater was transformed into a dynamic and expansive space for performance. Various architectural details in the set alluded to the 17th century domestic interiors in which baroque theater was often staged; at the same time, the landscape pattern transported viewers to the forest of the myth on which the opera was based. Jib doors, puncturing the walls of the set but not its overlain pattern, allowed singers to emerge from and disappear into the woods. The singers’ costumes were made using fabric printed with the same landscape pattern, such that their figures were obscured when close to the perimeter of the space. In the final scene, when the opera’s namesake character metamorphoses into the constellation Ursa Major, tiny LED lights embedded throughout her costume and the surrounding set slowly turned on as the theatrical lights dimmed, enveloping the entire space in darkness and twinkling stars.